Hydraulic system bleeding is necessary any time air has been introduced into system. 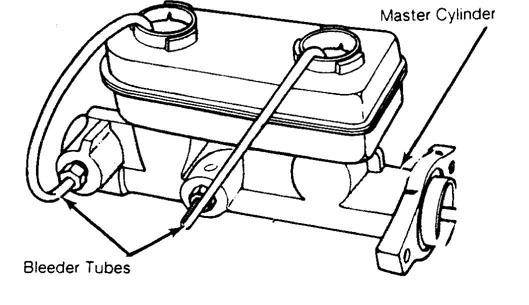 Bleed brakes at all 4 wheels if master cylinder lines have been disconnected or master cylinder has run dry. Bleed brakes with vacuum bleeding equipment, pressure bleeding equipment or by manually pumping brake pedal while using bleeder tubes. Always bleed brake lines in sequence. See BLEEDING SEQUENCE table. outlets of master cylinder. See Fig. 1. Fig. 1: Bleeding Master Cylinder Courtesy of American Motors/Jeep Corp.
are gone from master cylinder secure cap and install. brake lines and wheels after installation. Install master cylinder on vehicle after bench bleeding. brake lines at this time. cylinder or calipers may be require bleeding. valve to the entire brake system. (J-23709) during bleeding procedure. See Figs. 2 and 3. Remove valve retainer once brake bleeding procedure is complete. CAUTION: DO NOT use rigid clamp to position valve stem. 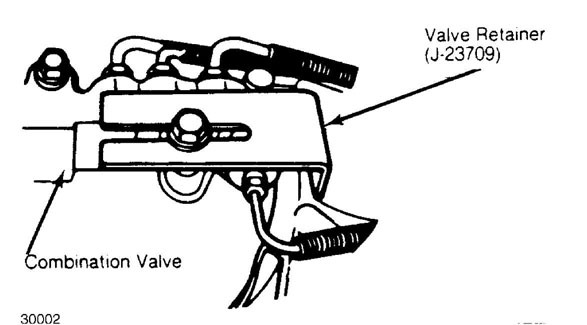 Damage to the valve assembly may result causing brake failure. Fig. 2: Positioning Hold Off Valve Courtesy of American Motors/Jeep Corp. Fig. 3: Positioning Hold Off Valve Courtesy of American Motors/Jeep Corp. Fill master cylinder. Install vacuum bleed equipment to first bleeder valve to be serviced. Open bleeder valve 3/4-1 turn. Depress vacuum pump and pull fluid into reservoir jar. Bleed each bleeder valve in sequence. See BLEEDING SEQUENCE table. serviced. See BLEEDING SEQUENCE table. filled with clean brake fluid so end of hose is submerged in fluid. SYSTEM BLEEDING in this article. table. 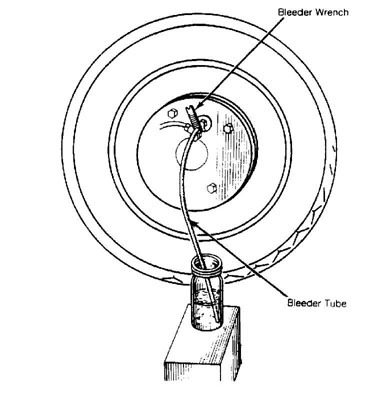 Open bleeder screw 3/4-1 turn and note fluid flow. Close bleeder screw when fluid flowing is free of bubbles. pedal operation after bleeding has been completed. hold off valve. Ensure that master cylinder is full of fluid. NOTE: When bleeding disc brakes, air may tend to cling to caliper walls. Lightly tap caliper, while bleeding, to aid in removal of air. procedure until flow of fluid shows no signs of air bubbles. When bleeding brake system manually, ensure bleeder valve is closed when brake pedal is released. Fig. 4: Wheel Cylinder Bleeding Procedure Courtesy of American Motors/Jeep Corp.
Before bleeding system, exhaust all vacuum from power unit by depressing brake pedal several times. Bleed master cylinder (if equipped) with bleeder screws. Bleed slave cylinder on vehicles equipped with remote mount power assist units. Bleed wheel cylinders and calipers in sequence. See BLEEDING SEQUENCE table.